Look for our exciting new menu and new look! Complete new drainage system for entire course. Lengthening of course to approx 6800 yards. Additions and improvements to tees, greens, and ponds. New paving around Pro-shop and cart paths. 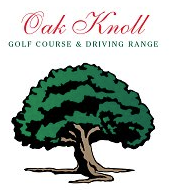 Welcome to the new Oak Knoll Golf Course! It is our goal to give to you, the golfer, the best experience for your investment. We know you demand and deserve it. That is why the golf course is being improved in a number of ways to further enhance your golf experience. Approximately 20,000 yards of dirt has been moved to many locations. Water drainage canals have been installed to help with winter runoff and overall course drainage. The yardage from the blue tees will extend to approximately 6,800 yards. Projected completion date of the project will be fall of 2004. Oak Knoll Golf Course founded in 1926 was the first course in the Northern Willamette Valley. New leadership is bringing many new and exciting changes to Salem's landmark golf course. Come check out the NEW restaurant re-opening this Spring for breakfast, lunch and dinner! Tee-Times are suggested and may be arranged up to two weeks in advance by calling the pro-shop at (503) 378-0344. We are open everyday from 8am to 5pm. Click Here for pricing information. Everyday: Free range balls with paid 18 holes.